4x12 Slant Guitar Speaker Cabinet Model # SA 412 Slant, Woofer Four 12" each has a 30 ounce magnet with a 2" kapton voice coil, 400 Watts RMS 800 Watts Peak, Wired at 8 ohms, 45Hz 5000Hz, Sensitivity: 96 db, Slant Top, 5/8 plywood front panel, Black carpet with black metal corners, Recessed handles, Full Metal Grill, Terminal cup with two 1/4" jack inputs, 29" tall 29" wide 14" deep, Weight: 71 pounds per cabinet, This speaker cabinet is brand new, One year warranty. 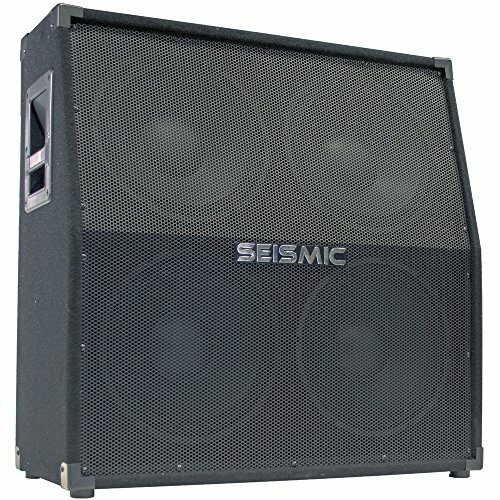 This listing is for one 412 guitar speaker cabinet. You will receive one 412, pictured and described above. This 412 has a very clear and distinct sound and tone. This 412 cabinet is designed for guitar use. This 4x12 slant half stack makes a great addition to our 4x12 straight half stack or can be used as by itself.